There has been much interest in a necked-down variant of the new 6.5×47 Lapua cartridge. Joel Kendrick, at the recent IBS 600-yard Nationals, won the Two-Gun Overall Championship with a 6mm version of the 6.5×47, formed down to 6×44. 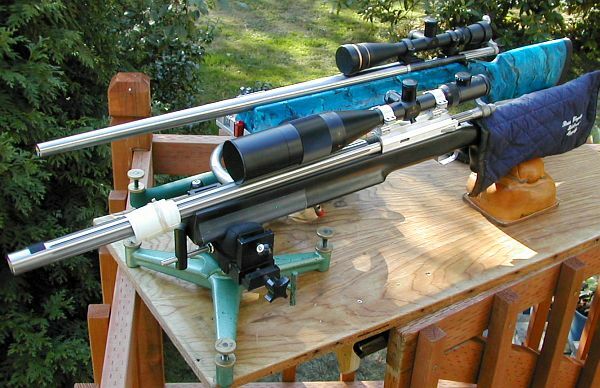 Robert Whitley has created another 6-6.5×47 wildcat, optimized for Highpower competition, which he calls the 6mmHOT. As supplies of 6.5×47 brass have just arrived recently, load data for a 6mm wildcat version is still hard to find. However, Washington state gunsmith Rick Beginski has already built four 6-6.5×47 rifles using a .268″ neck design. He was kind enough to provide AccurateShooter.com with this early report on his results with the cartridge. To give a solid baseline on the velocity potential of the new cartridge, Rick tried three different chamberings on two of his benchrest guns. On each gun, its barrel was first chambered as a 6BR, then as a 6BRX, and finally as a 6-6.5×47. This way everything was held constant, other than the chambering. Rick’s testing therefore shows how much added velocity you can attribute to the chambering alone. Rick reports: “So far, so good. Going from a 6mmBR to a 6-6.5×47 will give you an extra 200 fps easy, and that’s very conservative I’d say.” Once his barrels were completed as 6-6.5x47s, Rick was able to get good velocities and good accuracy with a variety of powders. And now that Forster Products is shipping a quality full-length sizing die for the 6-6.5×47, we think this wildcat will become very popular in the months ahead. I wanted to see actual velocity results from the same barrel, so I chambered two rifles in three steps, first as a 6mmBR, second as a 6BRX (a 6BR improved with 30° shoulder), and lastly as a 6mm-6.5×47. I already owned 6BR and 6BRX reamers, but I needed new chambering tools for the 6-6.5×47 since the cartridge is so new, and the 6mm version is still in its wildcat stage. 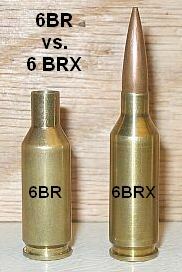 For my 6BR to 6BRX to 6-6.5×47 Lapua test, I tried to keep the test components very similar. The test rifles both use Tooley MBR stocks, and they both have Krieger barrels (one is a used 26″ barrel with about 600 rounds, the second is a new 30 incher). Both rifles are built with blue-printed Remington actions, one a 40X and the other a sleeved XP100. I initially chambered both rifles as 6BRs, to get a velocity baseline with the smallest cartridge. 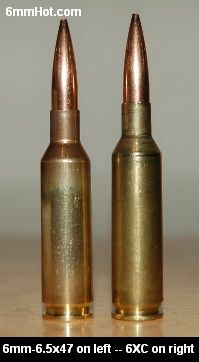 Using a relatively “standard load” of 30.0gr of Varget, the 26″ barrel averaged 2811 fps while the 30″ barrel delivered 2839 fps. I think you can attribute most of the velocity difference to the extra length. [Editor’s Note: During Jackie Schmidt’s 6BR Railgun test, we cut down a Krieger barrel from 33″ to 28″. The speed differential was 40 fps–with the velocity change very uniform at about 8 fps per inch of barrel length.] Note, I could have pushed these loads higher, but I wanted to use a fairly standard load that many guys are using in their 6BRs. For the second part of the test, I replaced the 6BR chamber with an “improved” version. Both barrels were made into 6 BRXs. This time I choose H4895, which has proven very accurate in many of the BRX rifles I’ve built for clients. The test load was 32.5gr of H4895. In the 26″ barrel, this load ran 2956 fps, while in the 30-incher it gave 3017 fps. NOTE: this data is not a recommendation, it’s just what worked in these test rifles. Always start 10% low and work up. As an experiment, I put together a third 6-6.5×47 rifle using a 9-twist Hart barrel. I was interested to see whether the 9-twist would work with the higher velocities this case can deliver (compared to a 6BR). I think the 9-twist is a viable option with some of the 100+ grain bullets. I learned this rifle really likes the 108-grain BIB flatbase bullets. The only powder I tried with the 9-twist rifle was H4831sc. With this barrel I could get to 3120fps with 41.0gr of H4831sc but it shot the best at the 38.6 load. More testing is in order for this one. I think the 6.5×47 case has a lot of potential as a hunting round. In a 6mm version, it will deliver performance very similar to a .243 Win, but with less powder, and the ability to mag-feed even with very long bullets. 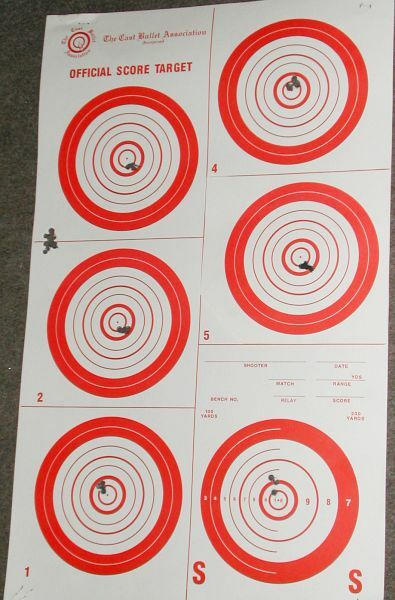 I recently built up a 6-6.5×47 hunting rifle for a 78-year-old friend who says his .270 is starting to kick too much. 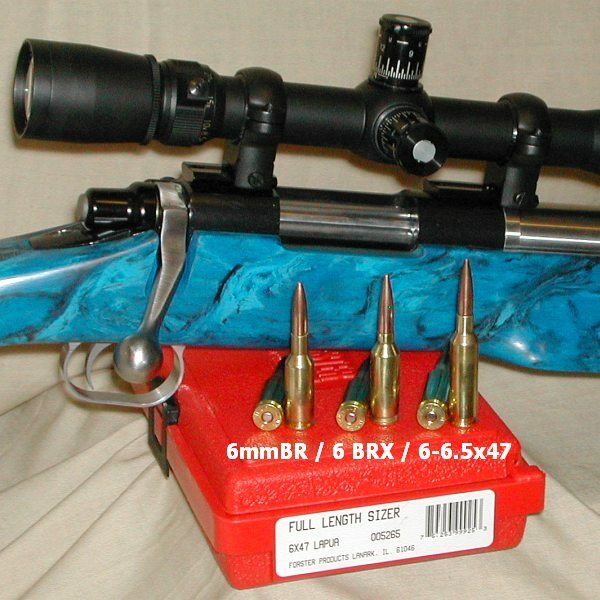 Shown in the picture below, this is a trued 722 Remington with extended bolt handle. The action is bedded in a Boyds stock, reworked for the BDL hinged floor plate and magazine. One good thing about this combo is that loaded rounds fit down in the magazine with bullets seated to the same COAL as the benchrest rifles so you don’t have to change your seating die settings. For owners of 6-6.5×47 competition rifles, building a hunter like this makes a lot of sense. Having a like-chambered hunting gun gives you a place to use your sorted-out brass, and I don’t think the coyotes will ever know this wasn’t your best ammo. The general consensus is that H4350 is a powder of choice for the 6-6.5×47 Lapua cartridge and the CCI #450 primer is also a primer of choice for some shooters, although this author found that he ultimately obtained great results with loads using N160 and a Rem 7/12 BR primer. The cartridge runs great with 105- to 107-grain bullets (Berger 105 VLDs stuck in the lands have been giving great results) and the DTAC 115s can be shot as well. With new, necked-down brass, the extreme spreads and standard deviation numbers are generally a little higher than if previously-fired brass was used. In addition, the Lapua brass, at 39.0gr of H4350, was still showing no pressure signs or issues, and it appears, in the rifle used, the load could be boosted higher. In looking for a moderate-pressure, “short-line” load for Highpower competition, Whitley also experimented with Vihtavuori N-160. Robert tells us the combination of N-150 and Berger 105s worked exceptionally well: “A loading around 36-37 gr of N160 with a Rem 7 1/2 BR primer and a Berger 105 BT bullet jumping .015″ proved to be very accurate and a great ‘short lines’ load for highpower. A 38.0gr load of N160 with a Remington 7 1/2 BR primer and a Berger 105 VLD (.010” in the lands) proved to be very accurate and runs just shy of 2950 fps. Further testing of long line loads with 39.0 grains and 40.0 grains remains to be done. The N160 load of 38.0 grains was nowhere near a max loading either in the rifle tested. With various previous chrono results so far, the chrono results with the above rifle show the Sierra 107gr MatchKing velocities parallel the velocities obtained with the Berger 105gr VLD with similar loadings. The target on the left was shot on August 13, 2006 with the author’s Highpower rifle (the same rifle noted in the chrono tests). The target was shot prone with a sling at 100 yards, and represents 10 shots. The load was 38.2gr of N160 with a Remington 7 1/2 BR primer and Berger 105 VLD bullets loaded .010″ into the lands. At around 2950 fps, this has promise to be a great 600-yard Highpower rifle loading, especially since there were no pressure signs. The disbursement of the group is mostly from the pulse and body movement of the author, while shooting unsupported and prone with a sling. The rifle, with this load, seemed as if it wanted to put the bullets all through the same hole if the author could hold still enough to do it.” — Robert Whitley, (215) 348-8789. Note: The reamer below was set up for Highpower rifle competition as a “no neck turn” reamer with .005″ neck clearance over a loaded round (i.e. non-neck turned loaded rounds measure right around .270″ at the neck). If you wish to neck turn and have special reamer requirements feel free to call Dave Kiff at Pacific Tool and Gauge to set up a reamer to your requirements. 6mmHOT information Copyright © Robert Whitley, All Rights Reserved, used by permission. Topics: Rick Beginski, Washington, Hart, Krieger, Vihtavuori, Hodgdon, Reloader, Reloder 15, Reloder 19, H4350, H4831, H4931sc, N550, N160, Lapua, 6.5×47, 6,5×47, 6.5-47, Finland, Darrell Jones, Heavy Gun, Light Gun, Remington, XP100, Actions, Robert Whitley, 6mmhot.com, 6mm HOT, Krieger Barrels, Tooley MBR, Rutland Laminate, Laminated, 6.5mm, 6×47, brass, Sierra Bullets, SMK, Berger, Cauterucio, F-Class, 600 yards, 1K, IBS, NBRSA, 300m, 800m, Varmint, Varminting, Jewell trigger, Benchrest, BR, Bench Rest, Single-shot, competition, rifle accuracy, Alliant, Rem 7 1/2, 7.5, CCI BR4, CCI 450, CCI primers, Alliant, Berger, Dave Kiff, Pacific Tool & Gauge, Pacific Tool and Gauge, Lathe, stocks, Weaver, Wilson Die.